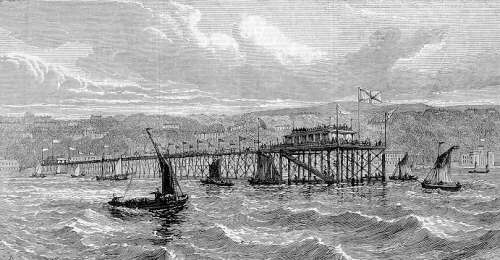 Designed by John Dixon a London Engineer and built at a cost of £6500..
Foundation stone laid January 1869 and opened by Mrs Loch 19th August 1869; supposedly dismantled and sold to Rhos on Sea in 1892 though some doubt has been cast on this ; the refreshment room/pavilion at the end of the pier was used at Groudle as Dokie's Cafe. The entrance was at the foot of Broadway; the pier streching for some 1000 feet. The charge (in 1874) was 1d a visit, 1s 6d a month or 5s per annum.